One of the biggest saboteurs of healthy eating is your sweet tooth. Stocking the kitchen with sugar free snacks can help maintain your healthy diet. Hi, I’m organizing and lifestyle expert Lorie Marrero, and for 16 years I’ve helped people declutter their mind, body, spirit, and space. Here on this channel you’ve seen me mostly focusing on physical space, talking about closet and such. As we all know, the issues that show up with your clutter, and your physical objects, are not just about the stuff. It always has something to do with your mind, body, spirit as well. 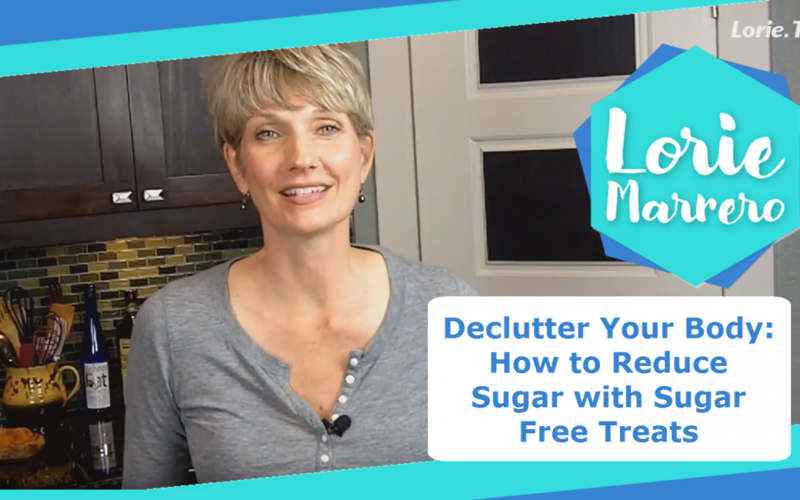 Let’s talk about delcluttering your body today, and reducing or eliminating the amount of sugar you eat is one of the best ways to do that. Easier said than done, I know. Sugar is a big issue for me. I have massive cravings. If I eat one cookie, I’ll eat the whole tube. It is really silly. The less sugar I eat, the fewer issues I have with that. I might eat sugar maybe once a week or something now, and I have found some great substitutes. Luckily I have a lot of friends who are authors and experts, and those of my friends who are nutritionists tell me there are three really good natural sweeteners that are healthy for us to use in moderation when we need something sweet for a treat. Those sweeteners are Stevia, Xylitol, and Erythritol. I want to show you a few things that I personally love that help me get past those sugar cravings when I do have them, and it’s just making life a little more fun. Lily’s Chocolate is one of my favorite things. This is the coconut flavor. The other flavor that I really like is sea salt, and they have a plain 70% bar. I love this because it’s sweetened with Stevia. There is zero sugar on the label, I think it says less than one gram of sugar. You can eat this whole chocolate bar and have not any sugar, that’s fantastic. I like this other brand of chocolate bars too that’s called, “Choco Perfection.” I have links by the way for all of this stuff below here in the description. I don’t have a Choco Perfection bar to show you because I ate them. You can order them, or you can look at them from the link that I have down there. Lily’s also makes chocolate chips. Here they are. I like these so much that I have a dedicated container in my pantry for Lily’s chocolate chips. By the way, here’s a tip for organizing your pantry. If you want to cut the packaging out and put clear packing tap over it, you can keep the original packaging, as well as the nutritional facts, and any kind of instructions or recipes that you like from the packaging. That’s what I do with Lily’s chocolate chips. Again, sweetened with Stevia. I have a great chocolate chip cookie recipe that I’ll tell you how to get in just a minute. That is another one of my favorite things. I like to have a little bowl of these with some nuts or something. It’s a great easy little sweet treat snack that has no sugar. As far as Stevia as a raw ingredient around the kitchen, I like to use the liquid Stevia because it is very pure. It’s just the plain Stevia extract, and distilled water or something. It’s no other fillers. This brand is called, “Stevita.” It dissolves instantly, I like to just put this in a cup of tea or something, plus anything else that I’m trying to bake, or substitute with for an old favorite desert that I’m trying to remake over. Anyway, this is the liquid. Then when I’m out and about, obviously this is too messy to carry around. I have theses Stevia tabs, these are made by Sweet Leaf. This little dispenser is in my purse all the time, and I just do this and a little pellet comes out that dissolves easily in my cup of tea. Those are great, then Xylitol is another thing I mentioned for a natural sweetener. I do know the owner of this company, she’s my friend Dr. Ellie. She’s a dentist, she’s very smart. She owns Zellie’s, and they make gum, and mints, and bulk Xylitol. She’s always saying that you should finish your meal with some kind of Xylitol if you can’t brush immediately. I thought that Xylitol was just a sugar substitute and it was good for your teeth simply because it isn’t sugar, so the fact that it would be sugar free is the benefit. Actually that’s true, but that’s not all there is to it. I didn’t realize that Xylitol’s actually very beneficial to your teeth. It actually helps protect your teeth, and lots of other things Dr. Ellie knows way more about than I do, but I enjoy learning that from her. Now I do think about Xylitol whenever I am not able to brush after a meal. Those are some of my favorite things. Again, the links are all below. You can find out a lot about all the tips and strategies I’ve mentioned in my new kitchen E-book. It’s kind of a passion project for me, I’ve been saving up all this information for awhile, waiting to get it into some kind of E-book format. I finally did it, it’s for sale on my website. You can see the link in the description below. I have all of these sweet treats, and little shortcuts, and smart steps in there along with how to organize your kitchen in general. The books called, “How to Organize Your Kitchen for Healthy Eating.” I hoe you enjoy that. Please share in the comments your favorite sweet treats and deserts, everything with natural sweeteners, or other little tips and tricks that you’ve found if you have a sweet tooth, and you’re trying to reduce sugar. Would love to hear about that. I’ll see you next time, may you always be happy and grateful for having more than enough.